I currently have a proposal in my state legislature for "An Act Promoting Work and Commuter Bicycles" by removing the sales tax on them. It's in the VT House Transportation Committee, and it looks like it is going to "die on the wall" before even getting out of committee because of generic state budget concerns. If you are a reader from Vermont, I'd appreciate it if you would write both the sponsors of this bill (John Bartholomew and Mollie Burke), and your House Representative for your district, and ask them to support this proposal. Why does everyday bicycling need to be actively promoted? Because we've had almost 100 years of heavily subsidized pro automobile policy, and our transportation system needs to be brought back into balance after the damage that this has caused. 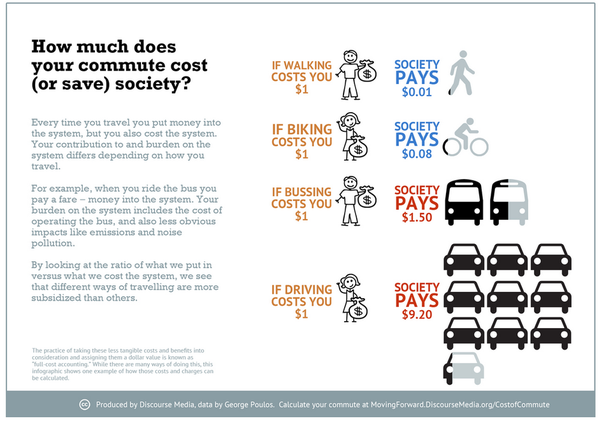 Everyday bicycling (which includes Bike to Work) provides the greatest benefits to both the rider and society. These include financial, health, environmental, personal well being, and societal benefits. The costs in this infographic are based on urban Vancouver, B.C. transportation. They appear to include personal and municipal costs and some health and environmental costs (immediate but not catastrophic), but not all costs of ownership. Automobiles are highly subsidized. There have been roads for thousands of years, but the automobile is effectively less than 100 years old. The first automobiles were built in the late 1800's, but the auto did not become common place enough to affect the average person's life until the 1910's. In much of the US around 1930 only every other family owned a car. 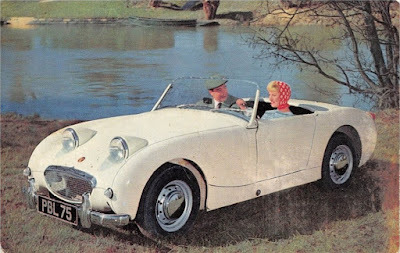 The car centered lifestyle we now have was built in less than 90 years. We should be questioning whether this is an appropriate use of technology and resources, or whether it is a prop for the obsessive compulsive side of our human psyche. Indeed, the better explanation of why we are willing to pay so much money for 38,000 fatalities (over 3000 a month) and 2.3 million injuries (half of which are disabling) each year in the US, (not to mention the 700 bicyclist or 4000 pedestrian deaths) is addiction. If you do not think that you are addicted to your car, then try to stop using it. 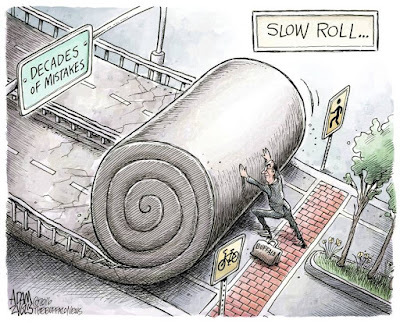 Our transportation system did not have to be built this way. 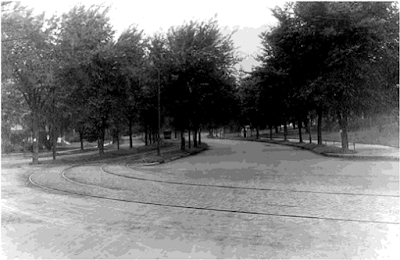 In addition to all season pathways for pedestrians, bicyclists, and the travel lane, Blue Hills Parkway designer John Charles Olmsted recognized in 1914 that many residents of the outlying city districts were unable to afford carriages, and included an electrified trolley line to serve them. My father owned an Austin Healey sports car when I was a child, and I have played with Porsches. I'm well aware of the joy of a pleasant motor ride through the countryside. This world does not exist anymore. Vehicle Miles Traveled (VMT) has more than doubled since I was a young driver, and the most common driving experience now is to be stuck in traffic. If you want to motor down the road like I did, then half the cars have to be removed. Our car centered transportation policy is seriously short sighted. We know that distracted drivers are a major cause of crashes, but we have yet to admit that those drivers are not there to enjoy motoring down the road. Wouldn't they be better served on transit where they can check email without the distraction of driving? Wouldn't active transport (walking and biking) for short trips improve our health and personal connections? Or a more fundamental question- why is it OK that we are now commuting huge distances? 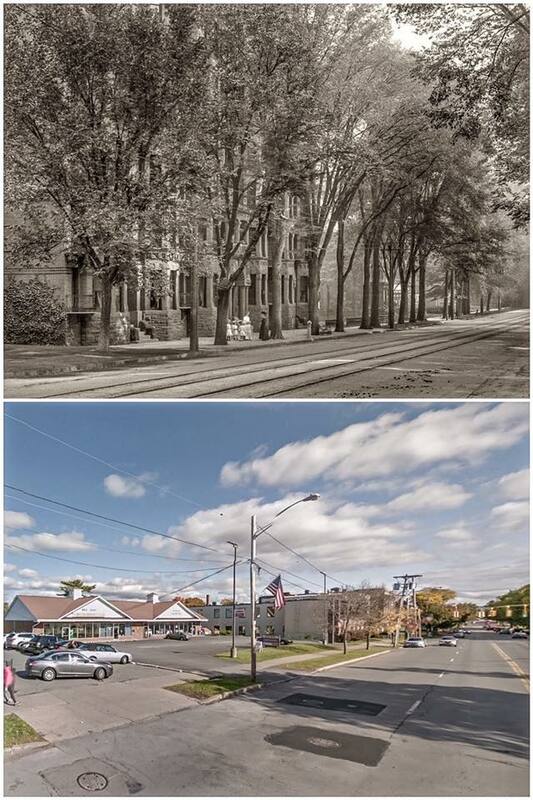 This is the result of 105 years of our current car centered transportation policy. And here is an even more fundamental problem- you may like Genesee Street in 2015 because you grew up on a street just like it and it feels comfortable, however it is not a functioning landscape. Natural ecosystems do not work this way, and it's turned out that human society does not function well this way either. This landscape is all about the car, not humans. A huge lack of diversity, social equity, or inclusion is required to make this landscape work. 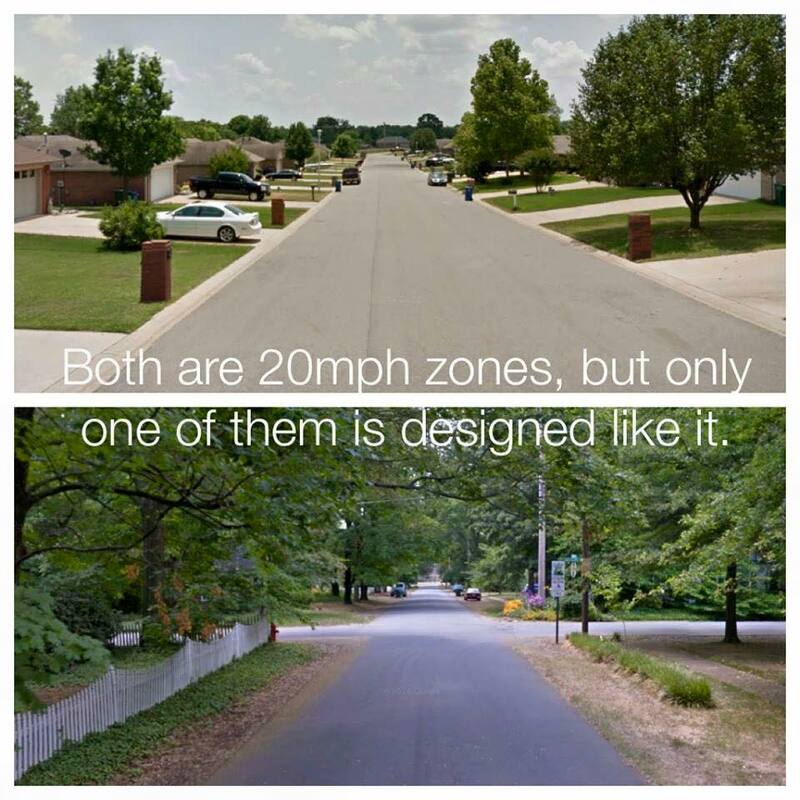 The way we think about transportation is flawed. Technology has changed our concept of what the car is and what the car does. With the increased levels of automobile use that we are seeing, our old paradigm of traffic management is broken. Do I expect "An Act Promoting Work and Commuter Bicycles" to solve all this? No, this problem has been building for 90 years and it is much too big and deep, Actively promoting everyday bicycling is a small beginner's step, but at least it goes beyond the "helmets and hi visibility clothing that politicians love because they don't actually have to do anything other than shifting the responsibility for it all onto bicyclists" (Анастасия Ромашкевич, Правда и ложь о светоэлементах, VeloNation), and is actually supporting a mode of transport other than the car. We choose the car for our trips because it is easy. It is now our job to make walking and bicycling just as easy. My estimate of the market share of work and commuter bikes is the most unreliable figure above, the national average is around 10%, but this would be quite high for Vermont because of the effect of the large California, Texas, and Florida markets. The overall mode share of people commuting by bike in Vermont is a fraction of a percent, and combined with declining bike sales at a time when we actually need more active transport, only underlines the need for a transportation policy that proactively supports bikes. 5% shift represent net savings of about $200 million per year. costs of injury from road crashes." Since this report was published in 2011 there have a couple of studies showing that the more bicyclists there are, the lower the crash rate. Shifting 5% of vehicle kilometers to cycling should result in less than 5 additional cyclist fatalities. As far as I know California is the only other state with a similar working and commuting bike proposal (here is a good summary on Streetsblog). I've had the chance to speak with Jeanie Ward-Waller, Policy Director for the California Bicycle Coalition, (http://www.calbike.org/), and their proposal is strongly focused on transportation equity. Their incentive is much larger than my sales tax exemption proposal, however they expect a more complicated qualification process, compared to the simple test for a work bike that I'm proposing. Both of our incentives face the same budget opposition though, and both could use support. I still enjoy Porsches, and I do think Electric Vehicles are important. But there are some deeply serious problems with the transportation system we have built, it's all been short term gain. We need to support active bicycling and walking. We have left the human out. Copied below is the proposal I gave to the Vermont House Transportation committee, it has not received a Bill number yet. In it I reduced all of the benefits of this proposal to short summaries for the legislators, but if you would like to follow up please feel free to send an email and I'll try to connect you with references. Statement of purpose of bill as introduced: This bill would promote the use of Bicycles used for working and commuting purposes through a sales tax exemption incentive. 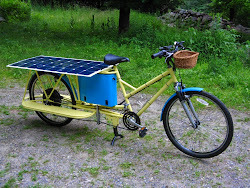 -May have an electric motor assist, which must meet the requirements set forth in the 2016 Vermont Transportation bill for electric bicycles. This proposal is not meant to cover sport bikes, but the committee may wish to extend the incentive to include them because they share some of the benefits of work and commuter bikes. The price of bicycles suitable for work purposes can vary widely from $100 bikes to $5000 or above. An incentive based on a fixed amount such as used in many Electric Vehicle incentive programs would not work well, but using a sales tax abatement would automatically link the incentive amount to the price. This amount would also be approximately in line with many EV incentive programs. 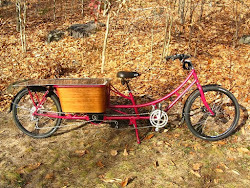 -Bicycles produce 10 to 12 times less GHG emissions and use about 90% less energy than automobiles. -All forms of human powered personal transport are at least three times better [for emissions] than any other form of commuter transport. -A working or commuting bike replaces a car, and will take up about 1/10 the road space, which helps traffic planning, traffic flow. and parking in urban areas. -Cycling infrastructure is also much less expensive than infrastructure for cars, helping to reduce road budgets for similar traffic capacity. -Road wear is proportional to the 4th power of the axle weight, and in general a 250 pound bike will have 1/1296 of the road wear that a 3000 pound car does, which is beneficial for highway maintenance budgets. -Complete Streets design guidelines create a roadscape suitable for multiple users, and this incentive would help to encourage bicycles on those streets. An electrically assisted bike can on average double the bike range to 5 to 10 miles. Thus a bicycle commuter or consumer will be doing business within their local area. which promotes down town businesses, center of towns and local economies. -Promoting working bicycles helps not only commuters that ride a bike directly to work, but also those with the First mile/Last mile problem that is connected with Park and Rides and transit. -Increased use of commuter bikes will also fit in with Amtrak's new program for carrying bicycles on the Vermonter train line. -Americans have an obesity epidemic, as well as cardiovascular issues, and a rising diabetes problem that are primary concerns for public health. Exercise has been shown to help these problems, and bicycling is one of the preferred exercising methods (second only to swimming), for being easy on joints while still providing a beneficial cardiovascular workout. -In addition biking to work is a mild exercise that is repeated as a daily routine so that it provides a continuing benefit. Many studies have shown that the health and medical benefits of regular bicycling outweigh the risks by around 20:1. -In 2016, the California Bicycle Coalition (CBC), along with several coalition partners, presented a petition to the California Air Resources Board (CARB). The CARB distributes funds for the Clean Vehicle Rebate Program (CVRP), which offers rebates for electric vehicles, and CBC is asking them to expand their rebate program to include “the cleanest vehicle of all: the bicycle”. CBC is seeking the creation of a $10 million Bicycle Purchase Incentive Pilot Program. The program would rebate half of the cost of bikes that are commonly used for commuting, up to a maximum rebate of $500. Under the program, California would pay for half the cost of cargo bikes, electric bikes, folding bikes, bike share, and other utilitarian bicycles used for everyday transportation. The CBC finds that in addition to the cleanest vehicle being excluded from the CVRP, that the CVRP program is also inequitable and discriminates against both low income persons and limited income families who do not own or can not own a car. -A second consideration is that for children and young people cycling and walking are the only forms of independent transport.